There were times Mike Kardec thought he could feel the magic of this place, a vague sense that just beyond his perception vast but subtle forces were at work… there was power out there, a great organic engine of death and rebirth. Louis L’Amour (1908 – 1988) is best known for his Western novels, but for a long time I knew him only for a couple of his non-westerns. Last of the Breed (1986) was about a Native American pilot downed in Russia during the Cold War, and The Walking Drum (1984), a historical novel set in the 12th century. 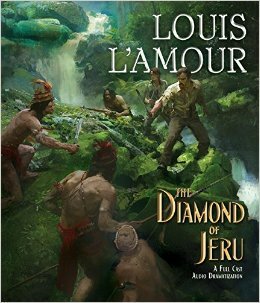 Later I read The Lonesome Gods (1983), which, though there were gunfights and horses, I assumed was still one of L’Amour’s atypical works. I enjoyed all of the above, which is why I greeted The Diamond of Jeru with a smile. L’Amour is a fine storyteller. The Diamond of Jeru is also not a Western. It’s set in Borneo in 1955, where our hero Mike Kardec (played by Joel Bryant) finds himself after the Korean War. He is hired by a Helen and John Lacklan (Traci Dinwiddlie and Time Winters) to guide them deep into the island to find a diamond. There’s a touch of magic in the story, so I’d call it a fantasy adventure. It’s presented as a “Dramatized Audio”, which I would describe as a rich audio drama with heavy narration. Joe Morton is the narrator, which is terrific because I can’t hear enough of that guy. He was perfect in some of Simon and Schuster’s Star Trek audio titles, and is excellent again here. In fact, all of the actors in this are top notch. 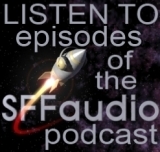 This cast is among the highest quality group of actors I’ve ever heard doing audio drama. On the video page of The Diamond of Jeru Audio Project site, Writer/Director Beau L’Amour and Producer/Editor Paul O’Dell discuss the making of the sound effects. Their methods sound excellent in the final production. I haven’t heard any other titles by this skilled team, but I’d love to hear one in which they rely more on the superb sound than on narration to establish setting and action. The sound had a very deep quality. Nothing out of place here. The story retained much of the pulp quality of the original story, which was welcome. The website has an audio sample as well as a history of the story, which was written sometime in the late 1940’s or early 1950’s by Louis L’Amour, then revised and expanded to novella length by Beau L’Amour. The original, unedited story can be found |HERE|.